Bake them, and they will come. 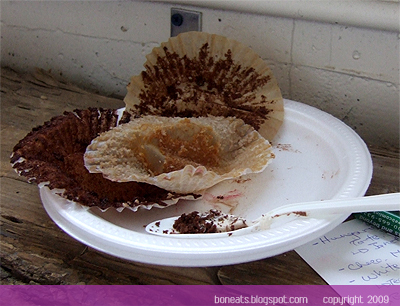 That was certainly the case for Toronto’s first ever Cupcake Camp. Organizers Monica and Michelle were thinking they’d be lucky if 100 people showed up, but it was more like 300 plus that packed themselves in Labspace Studio to test out some tasty treats from Toronto bakers, both professional and hobbyist bakers like myself. With 39 bakers and about 1000 cupcakes on display, we certainly needed that many people to consume all the cupcakes! Cupcake Camp TO is actually a spinoff of a popular event held each year in San Francisco by the same name. It’s a gathering of cupcake bakers and lovers alike, where folks can get together, share their creations, eat some delicious cupcakes and chat with fellow bakers. My friend Suzie actually told me about the event, and I was instantly on board to go and bring some cupcakes myself. I mean, for $2, not only do I get a chance to showcase my cupcakes, but also eat some yummy cupcakes myself, as well as help a good cause (proceeds went to the Toronto Humane Society). So with an empty stomach, I went off to Cupcake Camp, bringing along with me two dozen Chocolate Cinnamon Cupcakes with Caramel Cream Cheese Frosting, pictured above. As 2 PM rolled around, the small studio was already packed with bakers and tasters, waiting to try the numerous varieties of cupcakes. 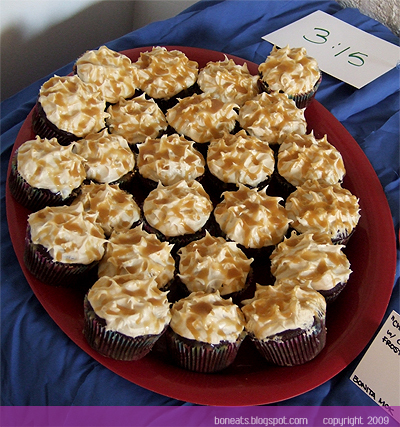 Many of the cupcakes there were absolute masterpieces—beautifully crafted with interesting flavour combinations. I already zoned in on a couple of cupcakes I really wanted to try—the only thing was being able to fight through the crowd to get to them when they were presented! Suzie then managed to show up in front of me with three cupcakes as I prepared to present my cupcakes to the crowd. After almost being manhandled by eager tasters, I escaped to our little tasting corner, where we split the cupcakes: Chocolate Malt by Krista Arndt, Peanut Butter and Banana by Kim Earles, and White Chocolate Raspberry by Team Delisio. The white chocolate raspberry had an incredibly delightful icing, with the slight tartness of the raspberries cutting through the richness and sweetness of the icing. 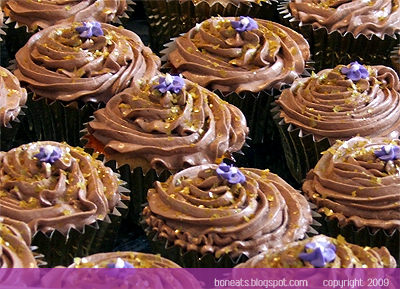 Both the chocolate cupcakes were incredibly moist, and each had an unbelievably amazing icing. The chocolate malt really tasted like its chocolate counterpart, while there are no words to truly explain how delicious the banana buttercream was. It was so light! 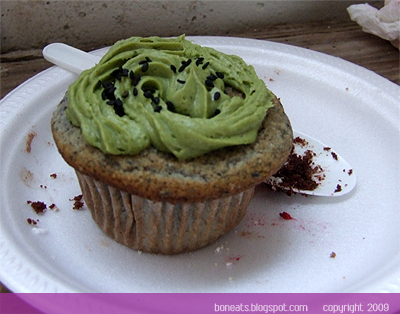 Next was a cute Asian fusion cupcake: Black Sesame and Matcha Icing by Andrea. I loved the cupcake base. The earthy, slightly bitter black sesame works so well here, and also made for a less sweeter cupcake, perfect for my palate. While I like matcha, I don’t think the icing worked as well here because the baker used a cream cheese frosting base, which I found overpowered the matcha. I would love to try this with a matcha buttercream if I ever have a chance to make this in the future! Already stuffed, I was pretty much done for the day, but as I was heading out, I bumped into Joanna Bandziorowski, who I had been chatting with earlier. I was really interested in trying her Vanilla-Coconut-Fennel cupcake, and since she made mini ones, I decided to grab one. 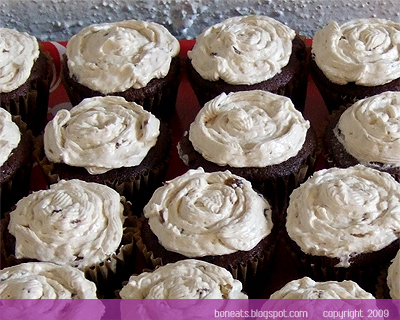 They smelled so sweet and vanilla-y, with flakes of coconut and fennel seed sprinkled throughout the cupcake. The perfect ending to an already perfect day! Well, let’s just say I’m all cupcaked out after consuming 5.5 cupcakes in the span of 3 hours. (OK, technically it’s 4 since I did split three of them with Suzie!). I still have one more cupcake waiting for me in the fridge for tomorrow, the masterpiece Fig-Walnut and Caramel cupcake by Valerie Foster! I’m slowly coming off my sugar high and I’ll have to hit the gym stat tomorrow, but right now, I’m just going to relish in the fact that I got to taste some amazing cupcakes today by some incredibly talented bakers. Cupcake Camp TO was definitely a huge success, and I’m already looking forward to the next one! Posted by Bonita at 8:03 p.m.
Suzanne Gardner January 25, 2009 at 10:23 p.m.
Andrea January 26, 2009 at 7:51 a.m.
Hi! I posted the black sesame cupcake recipe on my blog so you can try it yourself if you like! I admit that I am an amateur and not much of an innovator when it comes to baking, so if the recipe suggested cream cheese icing, I made cream cheese icing. Ah well, everything can be improved upon, right? miVi3k January 26, 2009 at 11:34 p.m. It was great meeting you guys as well as the other bakers at Cupcake Camp! We're already gathering notes and comments from people on how we can make the next one better! @Bonita - your cupcake might have been the ONLY one I managed to snag while running around like a chicken with her head cut off. YUM! Joanna January 26, 2009 at 11:36 p.m. It was terrific meeting you. I'm glad you enjoyed my cupcake. I didn't get a chance to try yours, or most of the others. The Camp was a great idea, and by the time the next one rolls around hopefully it will be organized a bit different, so that it's not completely chaotic. Bonita January 27, 2009 at 8:04 a.m. Thanks again for organizing this! It was great fun, and I'm definitely looking forward to the next one! It was a bit hectic Sunday though, wasn't it? I think next time around, I'll bring some extras to set aside just for the hard-working (and fabulous!) organizers and volunteers. Bonita January 27, 2009 at 3:50 p.m.
Vonnie January 27, 2009 at 10:33 p.m.
Cupcake camp?! That sounds like the best idea in the world! Glad you had a nice day - I'm sitting here at 3.30am, heavily pregnant and craving cupcakes now! Janet Burnup April 22, 2010 at 10:20 p.m.
Hi Bonita! sadly i JUST saw what you posted about my Hungarian Dubosh Torte cupcakes! Thank you for those kind words! 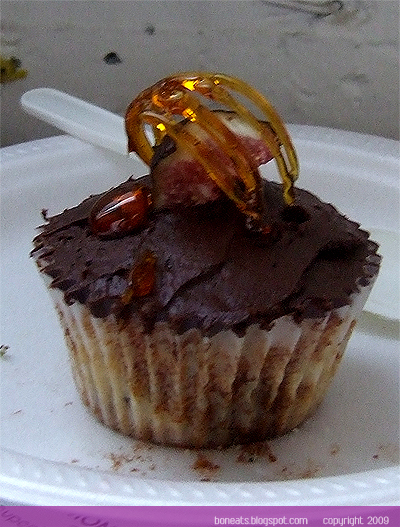 I will be at cupcake camp 2010 this may 2nd with something that I've been dying to try! Hope you can make it there!